In the third and final extract from her book, The Teachers of One, in which she documents her very first spiritual journey to India, Paula Marvelly, Editor of The Culturium, ascends Mount Arunachala to sit in Virupaksha Cave and experience the oneness of the Self. THE LIFE OF Bhagavan Sri Ramana Maharshi was immaculate humility and benevolence. He showed compassion to all beings—animals, thieves, people from all castes, religions and creeds. He refrained from getting involved in worldly activities; he never handled any of the ashram money nor did he answer letters addressed to him, though he would always welcome anyone into his presence. Ramana also wrote down very little of his teaching. The only verses which arose spontaneously were Eleven Stanzas to Sri Arunachala and Eight Stanzas to Sri Arunachala; the rest of his poetry being produced specifically at the request of a disciple to elucidate a particular point—put altogether as a collection, it only forms a slim volume. And his most well known work, Forty Verses on Reality or Ulladu Narpadu, together with its forty supplementary verses, constitutes just over ten pages of written text. “All this is only activity of the mind,” he remarked to a visiting poet. “The more you exercise the mind and the more success you have in composing verses, the less peace you have.” Nevertheless, he did meticulously edit the books published during his lifetime to ensure accuracy of meaning, leaving no room for misunderstanding or misinterpretation. No possessions, no money, I reflect. No hypocrisy or hidden agendas, no egotism or conceit. No relationship scandals, no money scams. No abuse of power, no deceit. Absolutely nothing about the way in which Bhagavan Sri Ramana Maharshi lived his life can be misconstrued. How I wish I could have met him, received his blessing, his upadesa, his smile. Nonetheless, the likes of Ramana are rare indeed. A teacher of such calibre only comes, some would say, every five hundred years. Ramana himself spoke of the differences in absorption in the Self, which can be either temporary or permanent. Nirvikalpa samadhi Ramana likened to a bucket lowered into a well; the water in the bucket merges with the water in the well but the rope and bucket (representing ego and its attachments) still exist, meaning that the bucket can always be pulled out from the well, ending the total absorption. Meanwhile, sahaja samadhi he likened to a river flowing into an ocean, whose waters become inseparably merged. Ramana’s sahaja samadhi happened spontaneously at the age of 17—for me, is nirvikalpa samadhi all I can really hope for? The Temples and Tank of Walkeshwar at Bombay. Ramana’s teaching was not the beginning of a new religious movement nor did it spawn social and political upheaveal, bloodshed and war. Rather, it gave access to the simplest and most ancient of philosophical truths to those living in the modern world during the Kali Yuga, a period of profound spiritual darkness. This echoes the prophecy of the Lord Sri Krishna in the Bhagavad Gita, when he tells Arjuna that, in times of human ignorance, he will reincarnate to restore the dharma. Indeed, a guru is needed to dispel the illusion of ignorance, though in rare cases the guru does not necessarily need to be in human form: “The outer guru gives the mind a push inwards and the inner guru pulls it,” Bhagavan said. Thus, Ramana’s presence was only to initiate devotees on the path, either by his speech, his look or through sitting in silence. Accusations of inconsistency in his instruction have been made but these apparent contradictions highlight the way in which Ramana taught at the level of the understanding and emotional disposition of the aspirant. For the Western mindset, intent on philosophical analysis and intellectual debate, Ramana prescribed Self-Enquiry as the most effective path, though it is paradoxically deemed to be the harder of the two methods: first, owing to its simplicity and directness; and secondly, because it breaks down the apparent veil of dualism (dvaita) that devotion and compassion between guru and devotee (from the point of view of the devotee) can bring about. 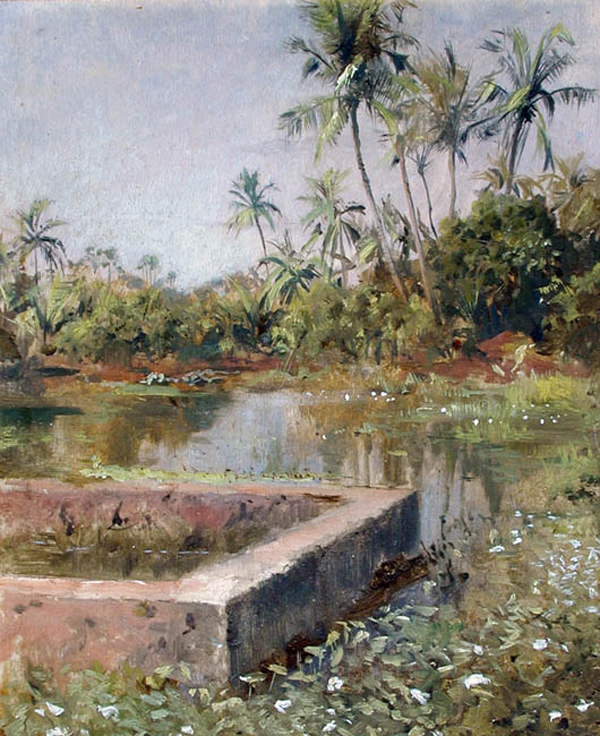 Edwin Lord Weeks, Sacred Lake, Bombay. I am halfway through my stay at the ashram. Whilst wandering around, I unexpectedly bump into Bharat [spiritual teacher, interviewed earlier in the book]. More synchronicity, I think. Just as he told me in our interview together, he has decided to stay in Tiruvannamalai for a while, hanging out and trying to decide where ultimately to settle down. I mention that I am hoping to walk up the hill and he offers to join me. So, next day, we set off early just after breakfast and start the climb up to the top. We take the gate at the back of the ashram, where steps have been made out of stone but soon the path levels off into one long steep path, which snakes its way ahead of us. A recent reforestation project has transformed parts of the lower terrain into beautiful areas of wooded glades and thick green carpets of grass. In Ramana’s day, the hill harboured wild animals, most notably tigers, though I am assured they no longer live here. And yet, despite the safety of the surroundings and its sylvan beauty, my awareness is soon lost in the physically exhausting task in hand. As we climb higher and higher, there is no adequate shade to shelter from the morning sun, which beats relentlessly down on us. As I still don’t feel physically well, not having eaten properly for days now, we have to stop and rest many times on the way. I continue to reflect on all the many interpretations of the same nondualistic truth I have heard. On the one, hand there is the more experiential approach of Papaji’s messengers, choosing to surrender to what is. On the other hand, there is the intellectual rigour of Self-Enquiry, principally coming from the Ramesh line, leading to an understanding of what is. And yet both approaches are accommodated within the teachings of Bhagavan. In him, seemingly everything is contained. We set off again. A bare-chested sadhu wearing only a white dhoti, his naked torso the colour of beaten bronze, namastes to us as he passes by. His forehead is daubed with holy ash with a vermilion gash of paste blobbed between his eye brows. Further along the path, a young boy has set up a stall of small statues, which he carves by the edge of the path. He beams excitedly as we approach—would we like to buy a statue of Siva, Hanuman, the wheel of Kali, Ganesh? I examine one of the pieces, a small carving of the elephant god, delicately chiselled in grey-blue stone. I buy it from him and he returns the transaction with a wide smile of brilliant white teeth. After nearly an hour of walking, the path plateaus out, affording a stunning view over Tiruvannamalai, which stretches for miles across the plain into the distance. And in the middle of this panoramic sea of buildings and urban sprawl, rises up the Temple of Arunachaleswar, a shrine to Ishvara, the personal God. It is probably the most breathtaking man-made strucure I have ever seen in my life, our position on the hill rendering us even more of a spectacular view than that from the ground. Dating from the 11th century CE, its fortress structure has four large gopurams or towers, rising to over 60 metres high, like huge electricity pylons waiting to conduct the very force of God from the heavens above. In India, worshipping God and his manifestion is part of everyday life. 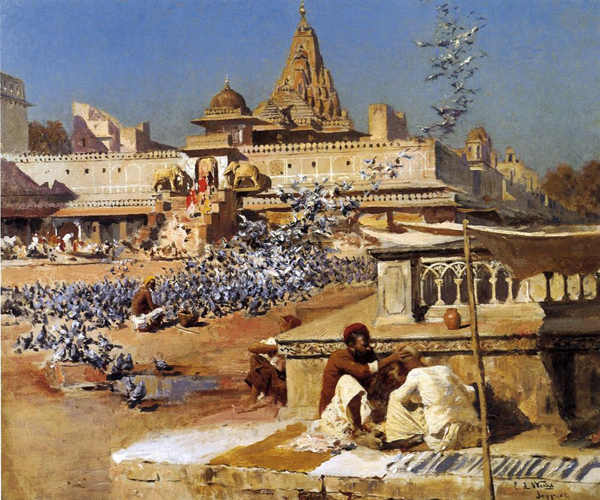 Hinduism is practised by approximately 80 per cent of the population, which represents more than 700 million people. To outsiders, it can appear to be a complex amalgam of conflicting philosophical theories as well as possessing a bewildering pantheon of goddesses and gods. At its heart, however, there is a central belief—Brahman, impersonal awareness, manifested within itself to become Ishvara, the personal god. Ishwara has three aspects, the trimurti, namely Brahma (the Creator, married to Saraswati), Vishnu (the preserver, married to Lakshmi and reincarnating as Rama and Krishna) and Siva (the destroyer, married to Parvati). Which god or goddess one chooses to worship is ultimately a matter of personal taste, tradition or caste, though, if sincerely practised, all ways lead to the ultimate state of absorption in the Self. 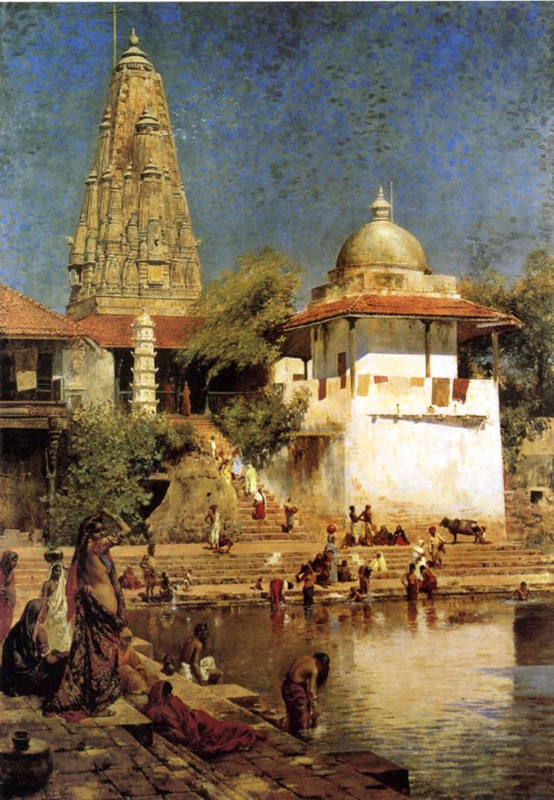 Edwin Lord Weeks, Steps in Sunlight, India. Finally, Bharat and I arrive at Skandasramam, a small dwelling on the side of the hill, looking out over the landscape. During the time that Ramana was living on Arunachala before finally taking residence at the foot of the hill, he stayed here in silence for seven years, between 1915 and 1922. This was also the time when his mother, Alagammal, came to join him both as maternal protector and disciple, cooking for him and tending to his needs. We pass through a gate and slip off our shoes. Skandasramam is a small grove where there are steps of rock to sit on to bask in the visionary beauty laid out before us. Dragonflies flit here and there and the air is filled with the music of running water, coming from a small spring at the back of the courtyard. We take the opportunity to rest and gather our thoughts, or lack of them, under the shade of sheltering trees, where the light on the ground reminds me of drops of liquid gold, like daubs of cyan in the paintings of the Impressionists. How easy it would be to find liberation in this Garden of Eden, I think. On the left of the dwelling is a small ante-room—above the doorway is a plaque which reads, “The Holy Room / The Soul of Mother Attained Nirvana”. Outside the main building there is a verandah, protected by emerald-coloured grilles and a corrugated roof. Inside, we pass into a small cool room. The doorway is low and, forgetting my relative height, I knock my head against the lintel. On the walls are black and white photographs of Ramana. In front of us is a much smaller room, where a handful of people are kneeling or sitting in the lotus posture in front of a small shrine to Bhagavan. Once more, the modesty and understatedness move me indescribably. There is a photograph of Ramana in the centre, flanked either side by a picture of Arunachala and a small book revealing his teachings. Even the candle placed in front of him burns with a graceful humility. I kneel before Bhagavan and then return to the outer room, where I sit and experience the sanctity of this holy place. The silence is so palpable that even the thinking of a thought would be a deafening noise. There is a sadhu called Skandaswami who looks after the dwelling. 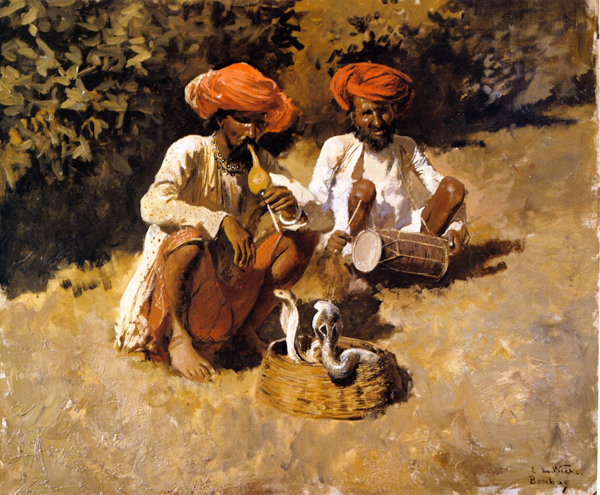 He sits on the shaded verandah, fanning himself with reeds. I notice a pamphlet propped up in one of the window frames—it is Who am I?, Bhagavan’s teaching and I start to copy out some of its contents. Skandaswami notices what I am doing and offers the booklet to me to keep. I am deeply touched, I motion with my hands, but decline—how could I possibly remove something from this sacred place? Virupaksha Cave, Ramana’s main residence for 17 years during his time on the hill, is a short descent from Skandasramam but the heat is rising as the morning sun climbs in the sky. Bharat and I decide, therefore, to return to the ashram in time for lunch. We hardly speak on our way back—there doesn’t appear to be any need for words. The following day, again shortly after breakfast, I take the same journey up the hill, this time accompanied by a South American girl, backpacking around India. We encounter bare-footed disciples, swamis and sadhus along the way. Then we pass by Skandasramam to the tapping of the statue seller’s hammer and chisel and negotiate the path that leads down to Virupaksha Cave. We cross over the small stream that cascades down the hillside and descend down steep steps, past rocks and tropical foliage. We move around a huge boulder and there, in front of us, is the place where all my wanderings have led. My heart is pounding. There is a gateway into a courtyard surrounding a small white building, which looks out over Tiruvannamalai and Siva’s Temple. The bows of trees hang over the compound, in which monkeys squabble and stare at me with their blushing faces. I take off my shoes and enter the dwelling under a plaque hanging over the door, which reads, “Virupaksha Cave / Sri Ramana Maharshi stayed here from 1899 to 1916”. A sadhu is resting inside and he rises silently to greet me. The floor is red and pink and on it there is an Indian mandala—a lotus flower surrounded in a circle, made from blue and grey stone. On the walls are black and white photographs of Ramana as a young boy and later as a swami. There is also a stone couch where he slept, indicated by the sadhu pointing first to it, then to a picture of Ramana and then putting his hands together under his cheek. The sadhu then escorts me into a dark room with a tiny doorway, where we have to duck right down to get through. It takes many moments for my eyes to adjust to the darkness. The sadhu leaves, returning with a cushion, indicating where I should sit. A handful of people seem to emerge from the darkness, all deep in meditation. Even my breathing seems to be a disturbance and I silently practise pranayama to steady my breath. Where the building ends is the rock of the cave. Part of the rock wall bulges into the room, forming a ledge on which there is a picture of Arunachala, surrounded by a garland of white flowers. There are also burning candles and a dish of holy ash. The sadhu beckons me towards him as he lifts a cloth covering the rock. He rubs it with his hand, generating a greyish powder. He smoothes it between his finger tips and then rubs it onto my forehead. I feel honoured by this simple ceremony, that my body has been baptized by the very earth of sacred Arunchala from the tomb of the great sage, Virpakshadeva, and where Ramana was absorbed in sahaja samadhi. I return to my seat and immerse myself in deep meditation. The silence of the cave consumes me. But whereas the silence in Skandasramam embraced everything in the world around me—its sights and sounds and smells—it was the merging with the silence of Prakriti. And yet here, with my eyes closed in the darkness, the silence has a depth and profundity I have never experienced before. Everything has been absorbed back into a blankess, a void, into the unmanifest spirit of Purusha. At first it feels disconcerting and unfamiliar. The cave is damp and the faint smell of incense makes my head feel giddy. As in my dream of a few nights back, the oily darkness seeps into my skin, filling up orifices and pores and I drown in a sea of blackness. But this is not the anaesthetized withdrawal into the unconscious that sleep brings. Now, I am fully present, fully awake—a witness to the withdrawal of creation happening within me. My thoughts and feelings have died and the world passes away. Time stops. The universe dies. Nothing remains. I exist no more. 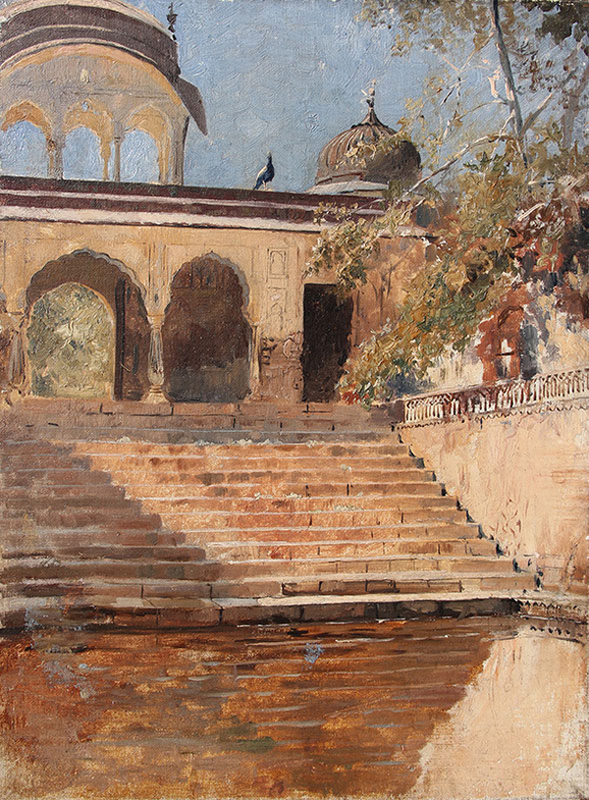 Edwin Lord Weeks, Feeding the Sacred Pigeons, Jaipur. After some time and for no apparent reason, the mind resurfaces and I decide to leave, so creep quietly out of the cave. The sadhu smiles and offers me a small garland of white jasmine, pointing to my hair. I namaste and attach the flowers to my hairclip. I then gesture to the sadhu to write down his name in my notebook. “Subramaman” he writes in bold capital letters. He then beckons me to a side room, where there are some pots for cooking and washing. Subramaman lives in this room, whilst looking after the cave during the day. He reaches up to a pot on a shelf, from which he pours out some powder and wraps it in a piece of newspaper. “Prasad,” he whispers offering me the parcel whilst putting some of the powder onto his tongue. I do the same, cautiously dabbing the grey ash on my lips. But I am pleasantly surprised—it tastes like burnt sherbet. I try and convey to him how much I am grateful for his gift and kind hospitality. Once again, we namaste. As I prepare to leave, he lingers by my side. I realize that the etiquette now is for me to offer a financial donation. But this particular day, I have left all my money and valuables in the ashram safe and have absolutely nothing to give him. I try to explain that I want to offer him some rupees but that I don’t have any on me. Suddenly, I feel quite wretched. Even though the ashram specifically states that one shouldn’t give money to sadhus on the hill and that any donations should only go through the ashram cashier, I still feel I have committed some awful faux pas, taken kindness from this modest and benevolent sadhu without giving anything in return. He waves his hand to show me that he has understood and returns to his chair, looking despondently down at the floor. The pangs of anxiety and regret linger in my heart the entire journey down the hill to the ashram. Indeed for days it plays on my mind and I consider whether I should go back to the cave to offer Subramanian a donation. But the two trips up the hill have left me physically exhausted and, reluctantly, I make the decision not to return. The days pass, each one blending into the next. I spend many hours relaxing in my room, reading, writing and trying to recuperate from my sickness, somewhat hindered by the fact that I am bitten on my lower left leg by a scorpion, resulting in my skin turning an alarming shade of red. But for most of the time, I stay well within the ashram precincts, not venturing out into Tiruvannamalai. The bustle of the main street running past the ashram is enough for me to taste southern Indian life. My favourite time of the day is tiffin, which is served in a room adjacent to the dining hall. I take two metallic cups and an Indian man ladles a stream of milky tea into one of them. I discover the ritual is to continuously pour the tea from one cup to the other and the higher the distance between the cups the better, enabling the air to cool down the temperature of the tea. It is absolutely delicious. It is my last evening in the ashram. Dinner is at seven-thirty. The Doctor helps out with the seating arrangements and when the food is distributed, Mr Ramanan serves everyone with ghee, which he pours over the rice. The food is particularly tasty this evening—soup, rice and vegetable curry, poppadums and pickle, followed by sweet rice, caramel papaya and a banana, buttermilk and curds. I decide to spend the evening in the Old Hall, the main meditation room where Ramana lived and gave satsang between 1925 and 1949. It is a modest room, tucked under the shade of a frangipani tree with large yellow flowers. Inside there is a stone floor, green shutters and an elaborate ornamental dado running around the walls. I am shocked by the number of people I find inside since the silence is so loud you could hear a pin drop. I find a gap by the wall and sit against it and close my eyes. Everything is so still. The focus of the room is Bhagavan’s couch, covered in Indian shawls, where he spent so many years dispensing his wisdom. A large framed hand-coloured black and white photograph of Ramana now resides in his place, depicting him reclining against some pillows with his long thin legs stretched out in front of him. It makes me smile to see this charming attempt to evoke the memory of his presence. As my taxi pulls away taking me back to Chennai, I look back at Arunachala in all its splendour, reaching up into the brilliant blue sky. I close my eyes, trying to burn the image on the back of my eyelids. I then turn around and look out to the open road ahead of us. “In the end everyone must come to Arunachala,” Bhagavan said. It is true, I reflect, for this is the end of my exploring and yet I shall never cease from my exploration of this most blessed life. 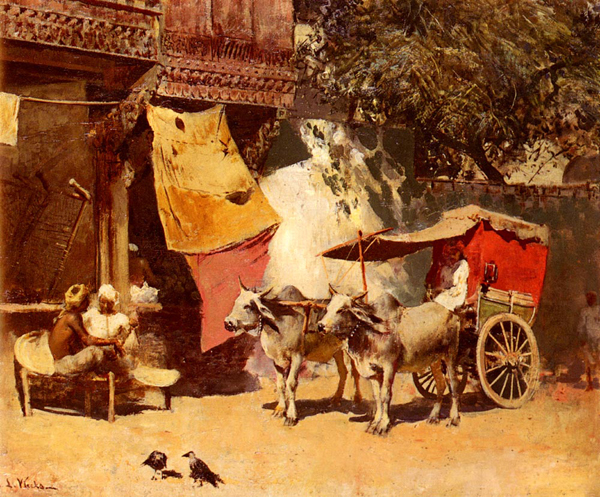 Edwin Lord Weeks, An Indian Gharry.